It was that time of year where every Scottish map is packed and we head off for our traditional Easter Scottish road trip! With the spring snow still good we headed for Aviemore and the Cairngorms for a spring ski! We decided to stay overnight in the ski centre car park to get the first lift up. We predicted the weather well and awoke to a good day! We were on the first train and the wee man was very impressed and excited by the Funicular. Being a Friday the slopes were very quiet and by the end of the day the wee man was skiing the whole of the Ptarmigan bowl on his own! It was soon time to head down the mountain and stay at Glenmore campsite. The plan was to ride through Rothiemurchus Forest to Loch an Eilein for a picnic before heading back up the logging way. The great thing about Rothiemurchus is it is a great place to ride whatever the age! The weather turned a bit wild so we decided to travel and head for Assynt. Having visited the Summer Isles we were keen to return and explore more! On the way we were battered by the weather but the scenery was still stunning! 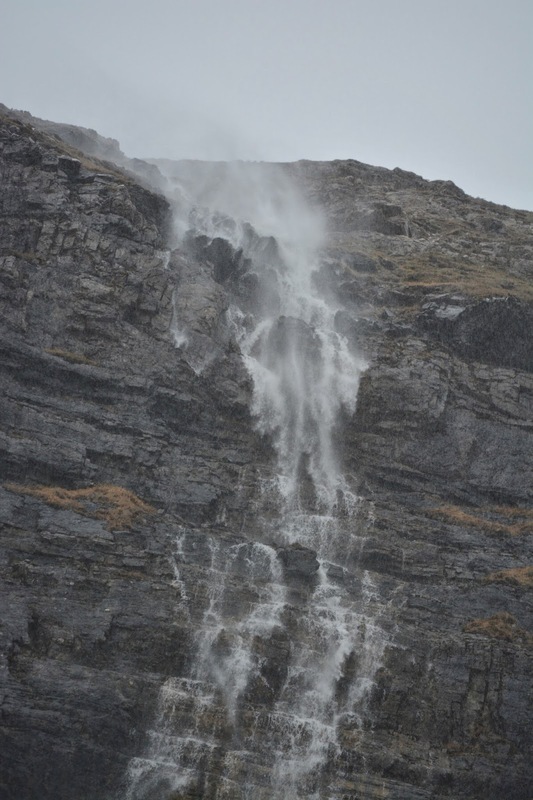 Wind blowing the water back up! After a quick campsite search we stumbled upon the Clachtoll Beach Campsite. We arrived on a wild day but it was still stunning! We explored until tea time and the wee man was enjoying riding his bike in such stunning scenery! 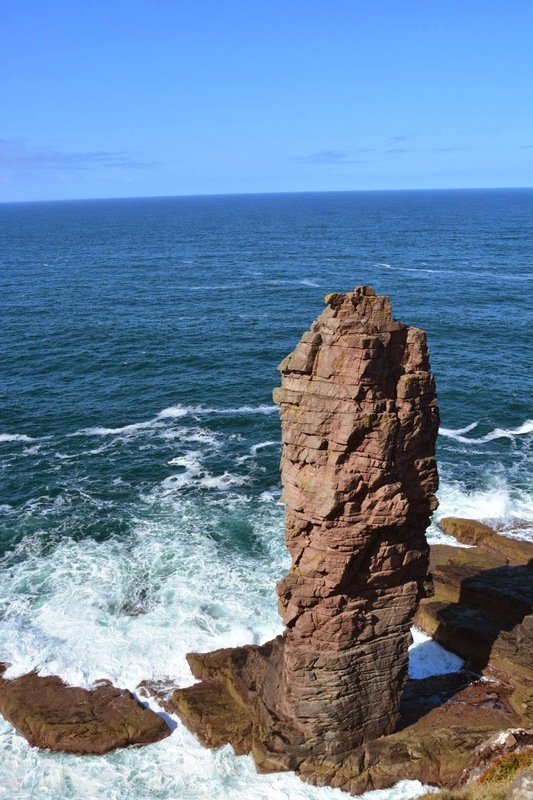 With the next day being fine the plan was to ride to Stoer lighthouse and walk out to see the Old Man of Stoer Sea Stack. The riding was undulating but the scenery soon took our minds off the burning legs. We arrived at the snack van at the lighthouse and after a quick cuppa we set off for the Old Man of Stoer. It did not disappoint! The walking was easy and the views fantastic. We did a circular route taking in Sidhean Mor. The views stretched as far North as Cape Wrath! After our picnic we headed back to the bikes and enjoyed the ride back to the campsite. The late evening sun was too tempting so another explore on the beach was in order! The next day we were to travel south to Coigach and the summer isles. 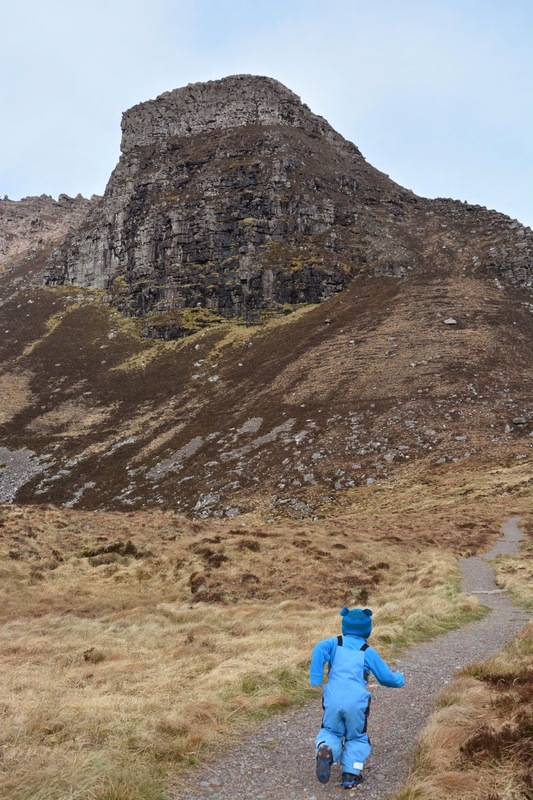 The weather was set to be good again and the plan was to walk Stac Pollaidh. The wee man was up for the challenge! The drive from Loch Inver to the car park at the foot of the mountain was interesting to say the least! Stunning scenery but not the widest road! The car park soon filled up fast but it seemed like we had the mountain to ourselves most of the way up! The top was full of little gullies and scrambly bits to explore! We were glad we packed the wee mans harness! He was soon climbing and exploring and enjoying the height more than a certain other person in the family! The walk was easy going and the hardest part was concentrating on the trail not the stunning view! It didn't take us long to reach the car park although at the grand old age of 3 the wee man was a little tired! For the next two nights we stayed at Port A Bhaigh campsite in Altandhu. We had stayed and launched here before it had been built when we did our previous Summer Isles Sea Kayaking trip. The weather had started to turn and it was starting to get very windy and wild! The plan was to eat at the local Am Fuaran Bar but after very poor service we vowed never to return! In the morning we travelled to Achnhaired Beach. This beach is so immense you can see it miles away from the road! Even on a wet and windy day it was still stunning! It was a great place to explore and chill out! The wee man was very excited by the numerous rock pools to get wet feet in! Back at the campsite it was time to bunk down for the night and be rocked to sleep by the constant wild sea wind! About 8pm the electric went off and after a test of everything our end we came to the conclusion that it must be a power cut! Waking up to the news that the whole of the North of Scotland had been blacked out made us chuckle! After packing up we headed for Loch Ness and Cannich Caravan Park. Before we headed for our base for the night we stopped off at Urquhart Castle. The wee man was expecting knights and dragons and enjoyed exploring! The castle has not got the most inspiring history but the views of Loch Ness were stunning! The numerous rain showers added to the excitement! After a quick tour around the gift shop and a new sword for the wee man we headed up to Cannich which sits at the foot of Glen Affric. The caravan park was nice enough and the wee man was taken by the play area! A quick evening ride up Glen Affric to Dog Falls was enough to stretch the legs. A brief off road explore bought us to a view point up the Glen. It was stunning! It was even better that the ride home was mainly down hill! The excitement was soon building for the ride around Glen Affric the next day! We once again can thank the Scottish mountain bike guide for such great descriptions of the route and for making us think that the route would be Weehoo friendly!! We awoke to a fantastic day and headed the ten plus miles up the Glen to the car park! The drive past Loch Beinn a' Mheadhoin was stunning and we could not resist a photo or two! The car park was soon reached and had a stunning view over Glen Affric with a well positioned picnic bench that we took advantage of later in the day! The bikes were soon off the camper and ready to go, along with the Wee Man and his sword just incase there were dragons in the Glen!! The route heads along good forest road on the South side and then a bit of a rougher trail on the North side to return. The views all along the Glen were stunning. Affric Lodge is soon passed and the route continues gently to the end of the loch. This was a great place for a snack stop. The whole route is only 17Km so we were determined to take our time and take in the stunning scenery! Being Easter it was time to crack open the mini eggs before crossing a small stream to reach a beach that was perfect for the Wee Man and his stone throwing! The track splits at this point and heads around the bottom of the Loch. There were a few obstacles to negotiate but this only added to the thrill of the ride! A good challenging short sharp climb is reached after the bridge before the track splits again. The other trail heads to the Glen Affric Youth Hostel It is possible to continue on, stay at the hostel and return in the morning, this is certainly one for the future! Heading on the North side of the Loch the views were just as stunning and the riding interesting! We passed more walkers on the North side and there were also more burns to cross! Wet feet could not be avoided! The only annoyance on the route was the two locked gates which meant the Weehoo had to be uncoupled! However this was a small price to pay for such a stunning ride! Once Affric lodge is passed the road becomes smooth and you soon arrive back at the car park. This would be some place to live thats for sure! A late lunch overlooking Loch Affric was a great ending to a fantastic day in this stunning Glen! The route is highly recommended! Not to waste a day travelling we called into the Nessie Centre on Loch Ness. The exhibition was very interesting and well put together and the Weeman found the playground fun enough for a run around! It was soon time to head south home but not before a stop off at Killiecrankie which was a family tradition! After numerous 'Why' questions about the soldier leaping and a good lunch we were on our way home. Our Easter Scottish Road Trip had not disappointed! Scotland really is an amazing outdoor playground!